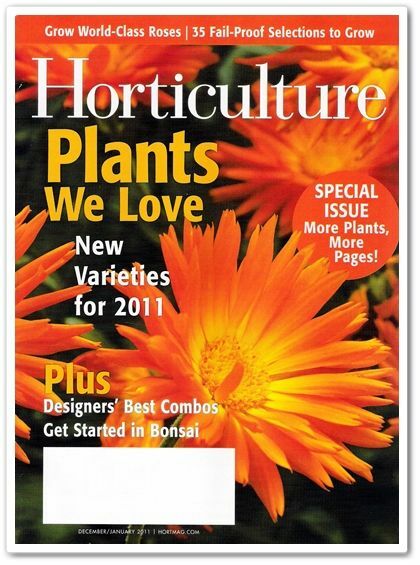 I've mentioned before that the first gardening magazine I ever read or subscribed to was Horticulture magazine. My mom had recommended it and I've been a subscriber for several years now. There's always something that inspires me and I never fail to learn something from each issue. 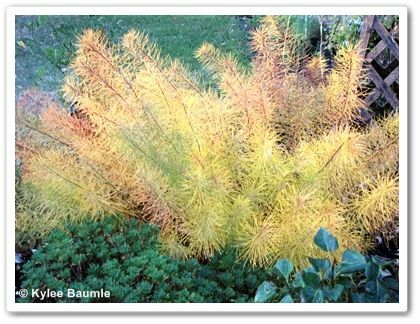 As I began to write this blog and then doing freelance garden writing, one of the dreams in the back of my mind was to somehow get published in a garden magazine, namely Horticulture. This month, my dream came true. 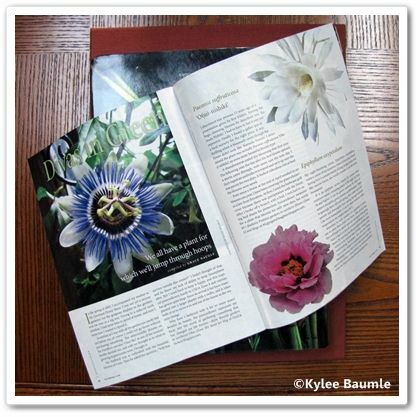 Along with contributions from fellow garden writer friends Barbara Pintozzi, Carol Michel, and Jean McWeeney, the story of my passion flower (Passiflora caerulea 'Clear Sky') appears on page 68, in a story entitled Divas in Green. 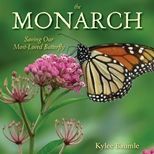 The subtitle tells the common point to each of our stories - "We all have a plant for which we'll jump through hoops." 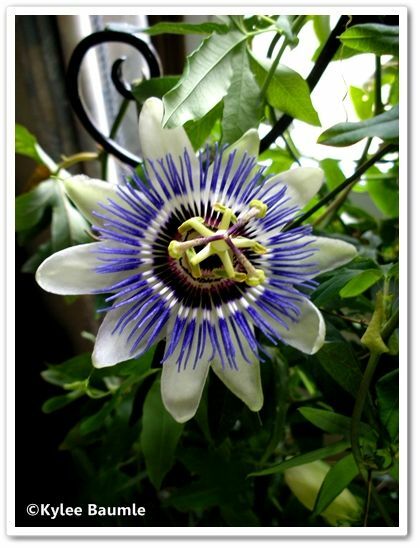 Oh yes, my passion flower has been the recipient of extra-special care since I first brought it home from the Cleveland Flower Show in 2005. It was the first plant I bought when I began gardening. This Passiflora isn't hardy to my zone 5b, so Romie and I haul it in and out as the seasons change from warm to cold and back again. It blooms sporadically year round and sometimes it blooms best in the dead of winter, in the west window where it resides when inside. Little did I know when I bought that gorgeous flowering plant over five years ago that it would still be around and making some of my gardening dreams come true. Its special care has been worth it in more ways than one. 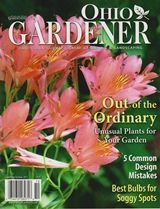 Other gardening friends are also featured in this month's issue: Rebecca Sweet, Jenny Peterson, and Carolyn Gail Choi, all of whom I've met personally and enjoy communicating with online. I'll never forget the summer I decided to wage war on the crop of thistles in our vegetable garden. I wasn't a real gardener back then; we just grew some vegetables every summer. Corn, green beans, carrots...the usual. Part of the garden was even left unplanted and that's where the thistles grew. I knew enough about thistles to know that you'd better get the entire thistle out - tap root and all - or that nasty thing was going to grow right back, probably bigger and badder than it was in the first place. So, I got my trowel and set to work. So intent was I on getting those nasty things out that I didn't realize what was happening as I plunged the trowel again and again into the hard clay soil, excavating each prickly plant out and tossing it onto a growing heap of them. Then all of a sudden, I stopped. I looked at the palm of my hand and there was the biggest blister I've ever had in my life, broken and bleeding. Silly me, I'd not worn gloves. The thistles had gotten the better of me and without even using their prickly defenses. I want you to know, though - I never had a problem with thistles in the garden after that. I'm serious. But now...now I grow them on purpose. I'm serious about that, too. 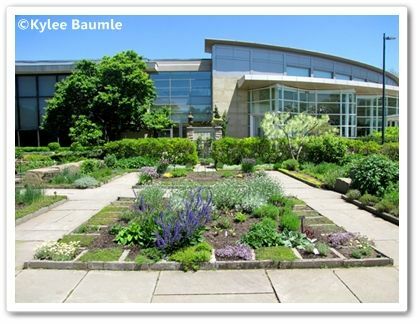 The last time I visited the Cleveland Botanical Garden, I saw milk thistle (Silybum sp.) growing there and I fell in love with it. It was in their beautiful herb garden. 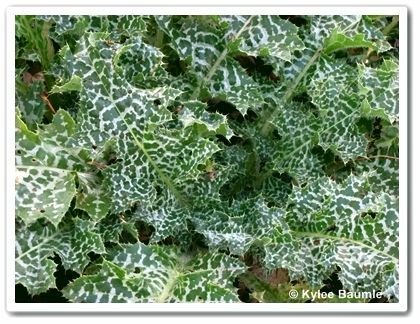 The patterns on its glossy leaves captivated me and even the prickly edges just added to its handsomeness. I didn't even know such a thing existed. I took pictures and filed it away in my mind as something to grow the next year. 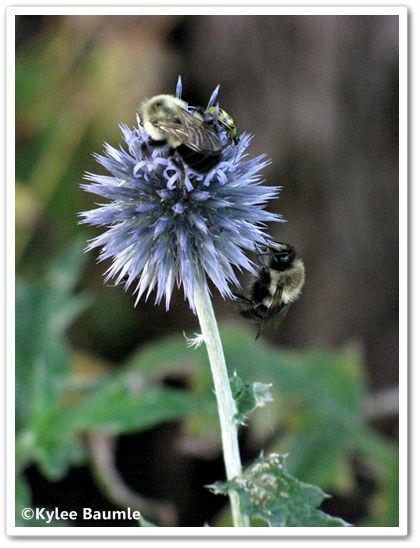 As I was window shopping online for seeds last winter, I came across those milk thistle seeds at Nature's Crossroads. I ordered them and planted them. 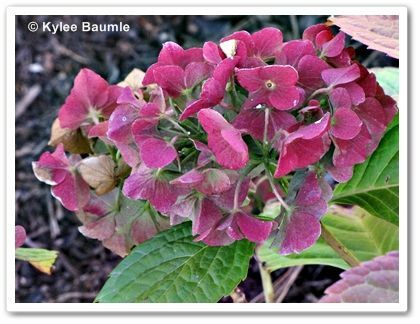 They grew and I loved this plant as much in my garden as I did in CBG's. We've had some really cold temperatures and my milk thistle plants still look good. They're a biennial and not all the plants bloomed this year, but I collected enough seed heads to assure that I'll have seed for planting it again next year, just in case none of it returns. Why would people grow milk thistle in the first place? I mean, it's a thistle, for crying out loud. But people grow globe thistle (Echinops ritro) too, so there's room for ornamental thistles in a garden. 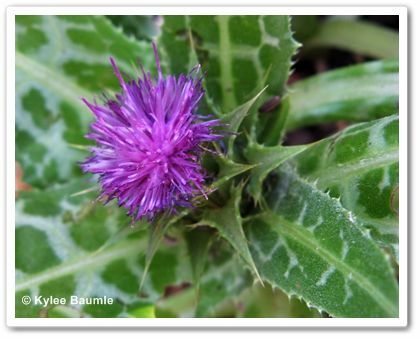 Milk thistle is also an herb, with extract from the seeds used for treating liver diseases. 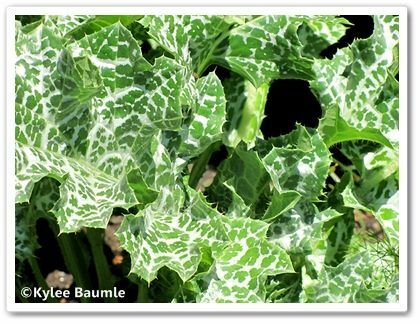 All parts of milk thistle are edible and when its prickly parts are trimmed off, it makes a good substitute for spinach in salads. Other: Listed as a noxious weed in Arkansas. Self-seeds. Annual/biennial, depending on location. 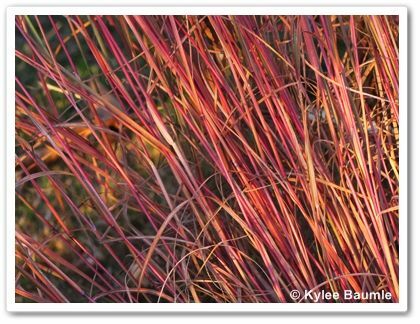 in the fall garden, made even more so by late afternoon sun. Even on a cloudy day, it nearly glows. really come into its own this second year in my garden. 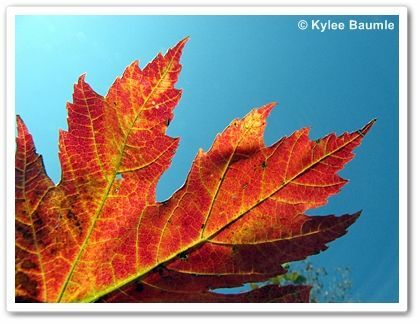 Nothing like maples to light things up in the fall! 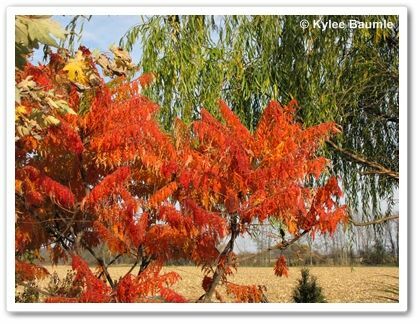 brilliant fall color. This is another common native in my area. 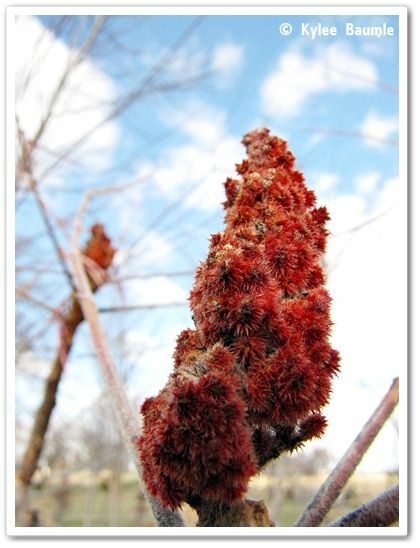 A closer look at the fruit of the sumac. 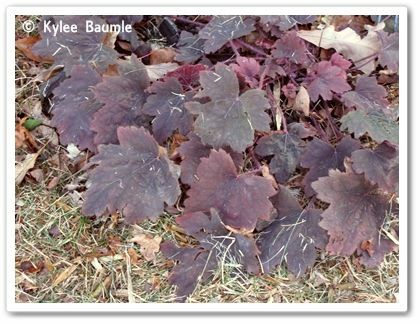 X Heucherella 'Sweet Tea' darkens to burgundy in the fall. It's not always about the foliage. 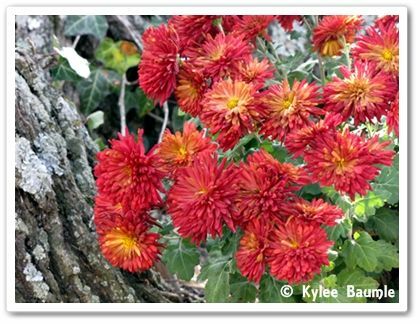 Mums provide important color, too. 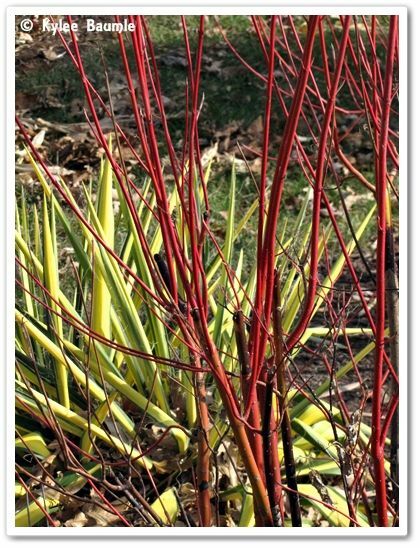 Another Cornus (C. kousa) has beautiful red color. indoors as dried flowers. They will keep this color! 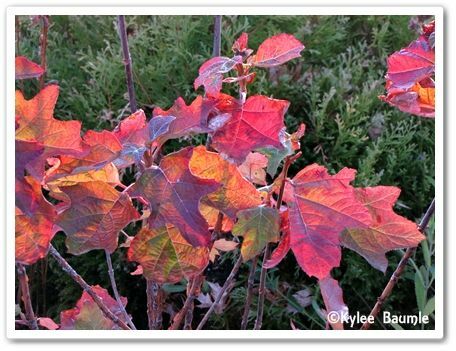 present a beautiful fall collage of color. 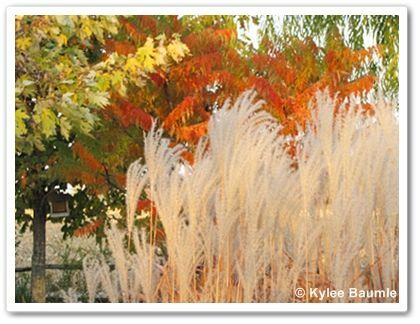 You can see many other fall color gardens at Dave's Fall Color Project. Older daughter Kara invited my mom and me to a luncheon that was held today in the city where she works. 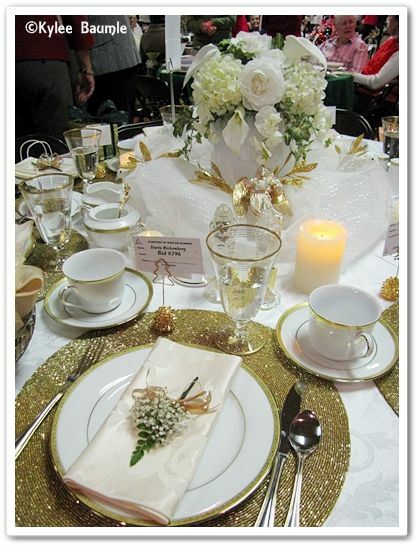 Called Tapestry of Tables, it's a benefit affair, where attendees are encouraged to bid on and buy items donated by local businesses. 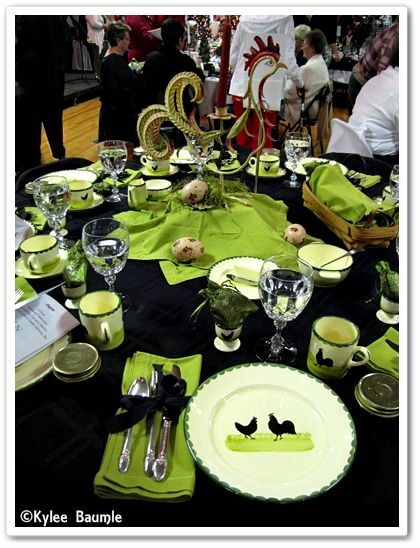 Country singer Martina McBride supports children's advocacy programs and also donated several items for this auction. 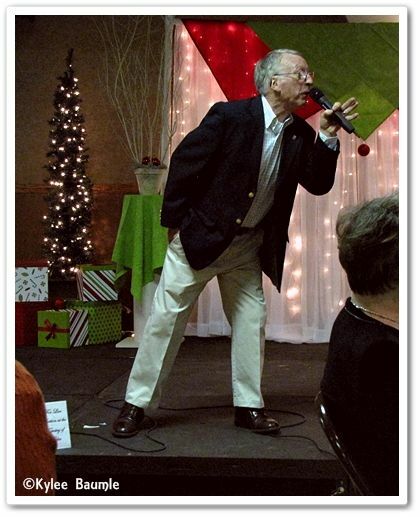 The proceeds throughout the event benefit The Center for Child & Family Advocacy, Inc., Henry County CASA/GAL, and the Henry County Hospital. 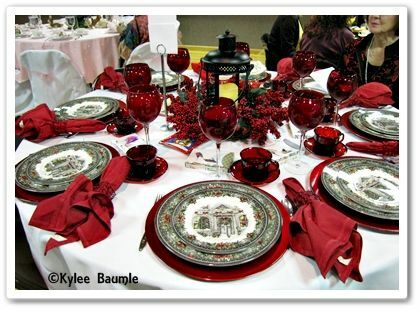 The Tapestry of Tables is just one part of the three-day event held every year. 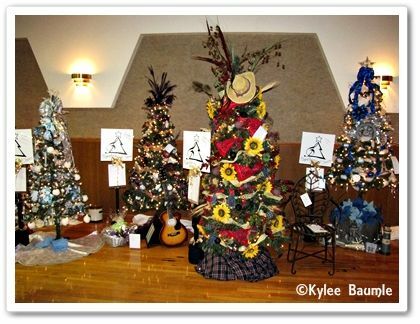 On display are decorated Christmas trees - Symphony of Trees - that will be sold during the event, by live and silent auction. 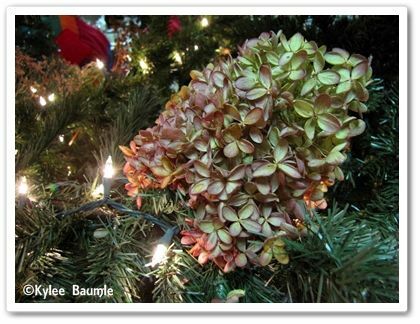 One of the trees was decorated with dried hydrangea blooms. 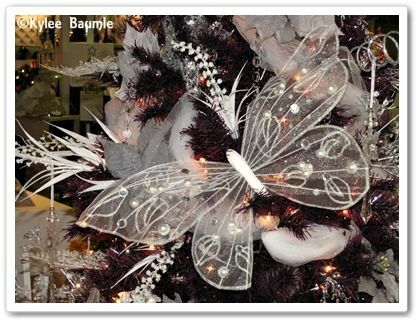 Detail from a decorated tree. 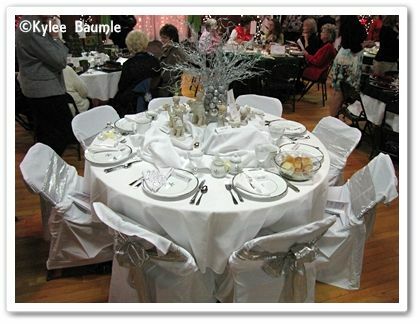 When we arrived, we had time to look around at all the decorated trees as well as the tables, each with a different theme. 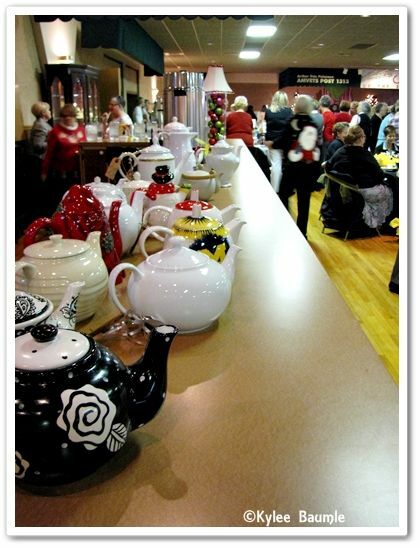 "There's No Place Like Home For the Holidays"
Not all tables had a Christmas theme. 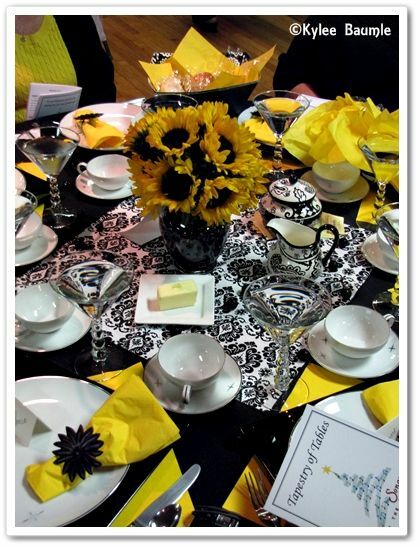 I really liked this sunflower table! out different kinds of dishes. These are hand-painted from Germany. 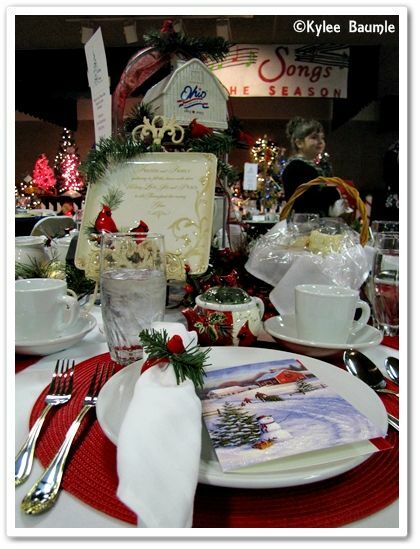 Kara's place of employment was one of the sponsors and she and a co-worker had decorated a table. 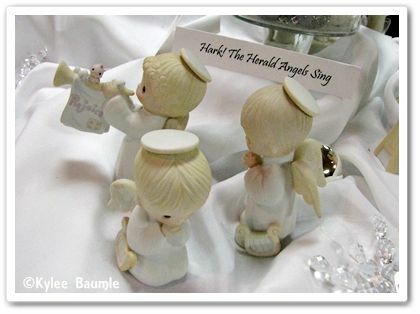 Many years ago, I collected Precious Moments figurines and Kara borrowed the nativity set for their table, called "The Most Precious Season." Of course, this is where we sat for the luncheon. 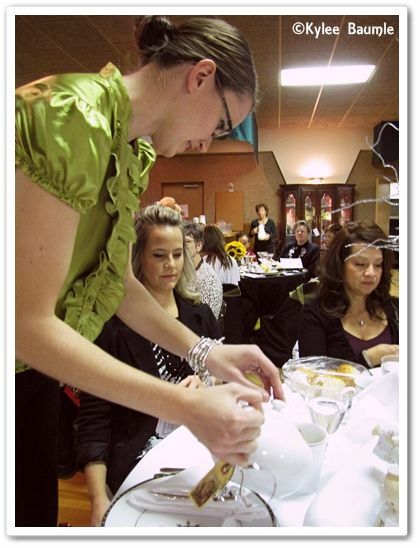 Kara poured the Cranberry Autumn tea. 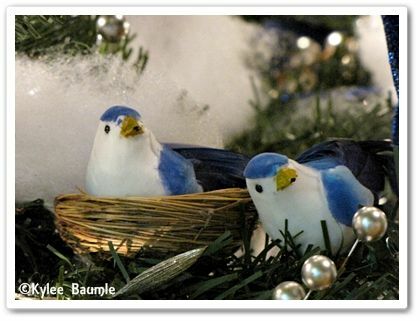 There was a gift shop set up, which had lovely home accessories, Christmas decorations, and garden decor. I purchased a very realistic artificial Kalanchoe (red blooms!) and a fat Santa. On the other side of the room, baked goods were for sale. I left the luncheon wanting to go home and put up the Christmas tree. I think this was just the thing to get me in the holiday mood! Our family will all be here for Thanksgiving, so maybe I'll have the house decorated a bit by then. Or maybe I can get them to help me do it. Ha! "The phenomenon reported is something real and not visionary or fictitious." I just don't know. All this talk of aliens and stuff. I'm a believer that God created everything but I am also a firm believer that we cannot possibly ever discover everything that He created. I don't even think that's entirely necessary, and gee...we have to have something to always be on the quest for, right? We'd get bored if there wasn't. My world is big and yet small, all at the same time. Heck, my garden alone is tiny in comparison to all there is in the world for me to discover, yet I'll never quite know or understand everything that goes on even in our little acre. Take something that's happening right this minute, for instance. A couple of weeks ago, I harvested some of the spinach that I planted early in September, or maybe it was late in August. I don't remember. But Romie told me it was good and since I never got to taste that first bit of it, and we were having some pretty nice fall weather, I decided to try planting another crop. Looks good, doesn't it? Romie assured me it was. I remember the winter of 2005-2006 and the spinach that never did die. We had green spinach that entire winter. I'd just clear away the snow and there it was, crisp and fresh as ever. This time, I decided to order a frost cover from Gardener's Supply for extra protection and it came yesterday. I took it out to the garden to cover the area where I planted the spinach, and that's when I saw "it." The chain link fencing was laid over the planted area so the cats wouldn't dig in it. Just what "it" was...well...that was up for debate and what better place to debate it than on Twitter. You can find out anything on Twitter. For real! Just type the question (in 140 characters or less) and let it fly. Someone will have the answer. It might not be the right one, but it sure will give you some food for thought. 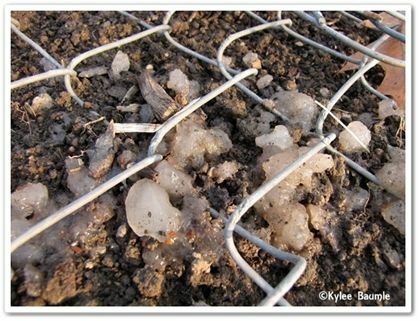 @ourlittleacre: WHAT on earth is this gel-like goop that formed over the rows of spinach seeds I planted? @marykir: do you use that water absorbing gel? I get stuff like that in my boxes when it rains a lot. Usually not so opaque though. 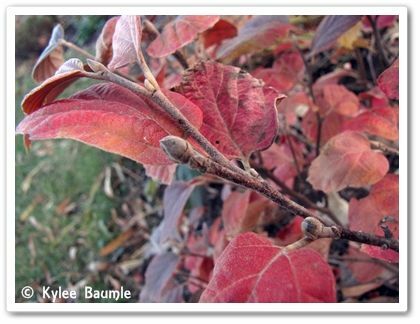 @gabbygardener: OK I am guessing, It may seed coat gel, with cooler weather is not breaking down and it is gathering at the soil surface. @AboutInsects: Hmm. Looks to me like fruiting bodies of some kind of fungus, maybe a jelly fungus. What's it feel like? Quick to appear? It feels like a gel, with a fair amount of body. It began appearing yesterday. @gardenfix: I think it might be slime mold. http://plantclinic.cornell.edu/FactSheets/slimemold/slimemold.htm Fact sheet says it grows pretty quickly under moist conditions. @AboutInsects: I'm assuming you didn't use any water retention gel beads, or potting soil with moisture control, right? 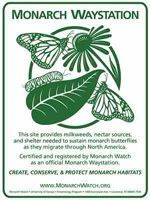 @AboutInsects: Actually, look up "star jelly"
@AboutInsects: Might try taking a sample to local extension office. May need a good microscope to confirm. Somewhere around this point, the conversation started to deteriorate while at the same time making great progress, and the late night crew came to the conclusion that it was alien snot. Yep, sure looks like snot to me. I was then urged to share this information with the rest of the internet. I mean, what if someone else has this in their garden and they need to know what it is, too? We've just saved them all that trouble of coming to the logical conclusion that highly trained tweeters took nearly an hour to figure out. 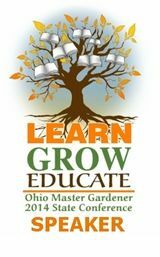 ...and @herbgardens and @nwheat chimed in with votes for slime mold and fungus. @gabbygardener stuck with her original theory of it being the natural seed coat congealing. Alien snot got the most votes, so all day today, I was satisfied with the idea that I had alien snot in my garden. After all, we had some crop circles near here several years ago, so alien visits were nothing new. And surely it's organic, right? Perhaps it will be the perfect soil conditioner for the tough clay we have here. Maybe it's a super fertilizer and we'll have a bumper crop of spinach. In December. 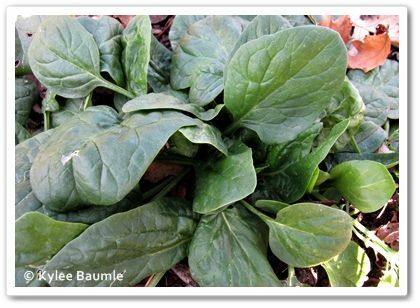 Or it could be that miracle ingredient that allows certain types of spinach to grow when there's snow! All thanks to aliens. Who knew? But the story wasn't over. No sirree. I'd also posted a photo of it on my Our Little Acre Facebook page and it was there that my dreams of being visited by aliens and having them deposit precious bodily fluids on my garden like fairy dust were dashed. "...the fruit coat [of spinach] becomes mucilaginous within little more than an hour of contact with an excess of water"
It is actually pretty common for seeds to exude slime -- some basils, and almost all salvias do lots of it. 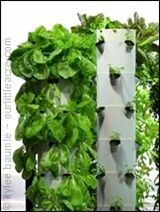 It is variously theorized to prevent seeds from drying out, inhibit germination under excessively wet conditions, or keep things from eating the seeds. Since the gel is in a line directly over where the seeds are planted, I would say this is exactly what is going on. @gabbygardener said this from the start. And while I find this to be very cool, although strange, I kind of liked it better when we believed it to be alien snot. 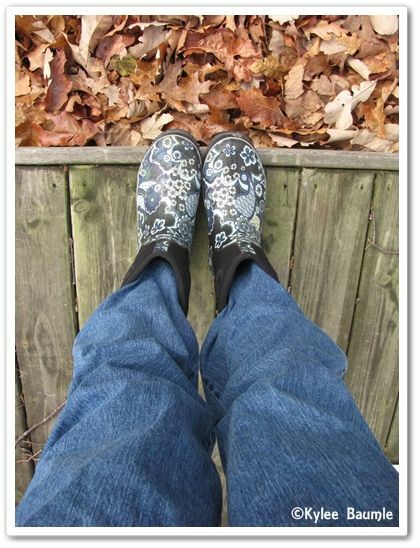 Snow Day Memories - And a Giveaway to Go With Them! 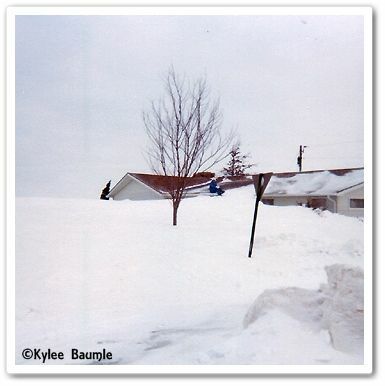 As we prepare for yet another winter here at Our Little Acre, I'm reminded of one of the very first winters we experienced shortly after we moved into our house. 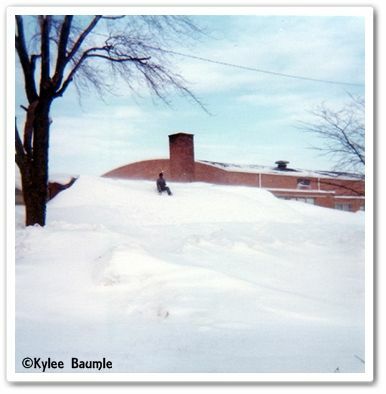 It was January of 1978 and on a Wednesday evening late in the month, snow began falling lightly. The weather forecasters had said we were to get a lot of snow with a lot of wind. Little did we know just what "a lot" meant. Romie worked second shift at that time, so I was usually asleep in bed by the time he got home from work. When the phone rang at 1:30 a.m. and I awoke to answer it, I noticed he wasn't in bed beside me. His voice on the phone let me know that the blizzard had arrived, but he wasn't going to make it home that night. He'd followed a snow plow as far as he could, which was to my parents' house on a major highway (US 127). I could hear the wind howling like nobody's business outside. I peeked outside, but could see nothing but white. By morning, there was more snow than I'd ever seen. Huge drifts were all around the house and the front windows were packed with snow - on the inside! The unbelievably strong winds had driven it through the smallest spaces, and it was still blowing. Our high school. That's Romie up there on the drift. Romie didn't make it home until Sunday, and then it was on a snowmobile. We weren't plowed out until the next day, and then we made a trip to our nearby village store, not for food, but just to get out and about to see all that snow and to talk to neighbors. 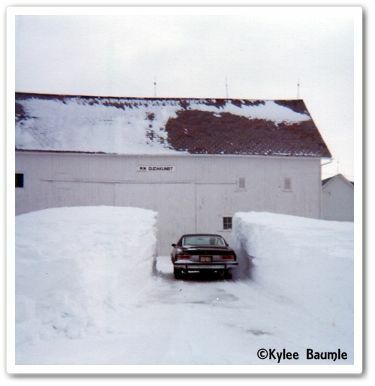 That was the Great Blizzard of '78. It was definitely one for the record books and one that many have heard about. I'm glad I was old enough to experience it. We didn't lose our electrical power, so we stayed nice and warm; others weren't so fortunate. We didn't have a snow thrower back then, but it definitely would have come in handy! We could have given it a good workout! We'll likely not see a snowstorm like that ever again, but we've had some good amounts of snow in recent winters. 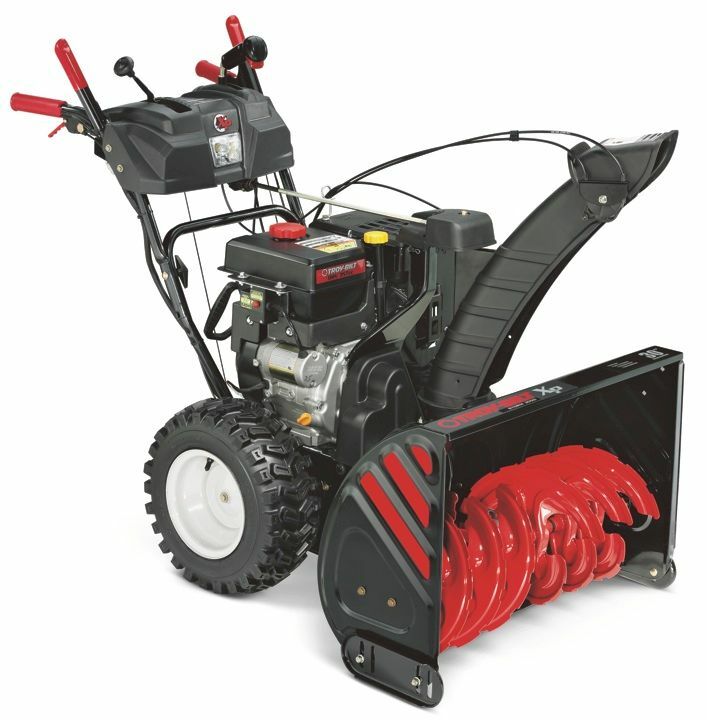 A snow thrower is a good thing to have when you live in Ohio! Our car in the driveway of my grandparents' farm. I walked right up this drift to the roof of our old neighbor's house! 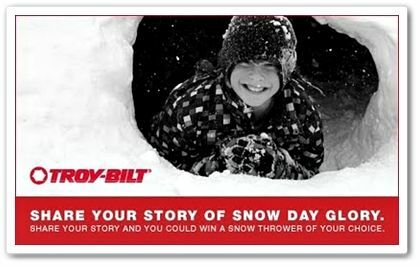 So tell us your best snow memory and one of these could be yours! This giveaway is sponsored by Troy-Bilt and is open to U.S. residents only. 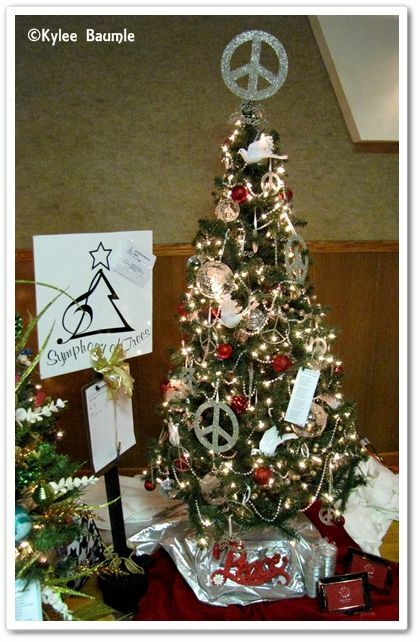 The contest will end at midnight on Friday, December 3, 2010. Winner will be selected at random from all eligible entries, using the Random Number Generator. 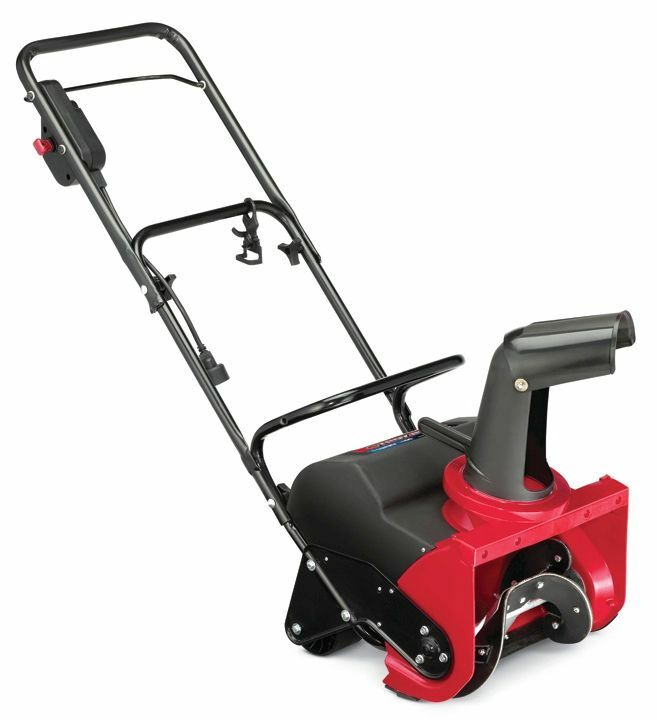 Our Little Acre will also be receiving a snow thrower from Troy-Bilt as host of the giveaway, and will be posting a review at a later date. 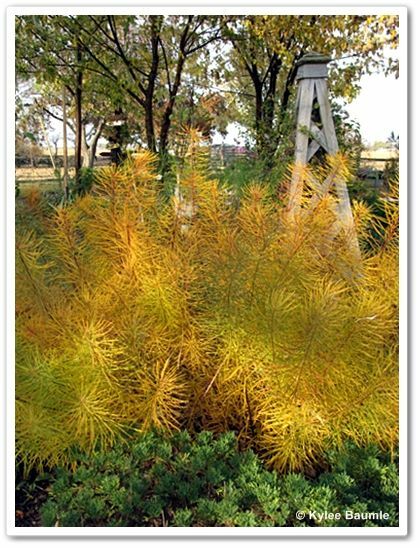 I currently own a garden product that I like and I want to share that information with my readers. 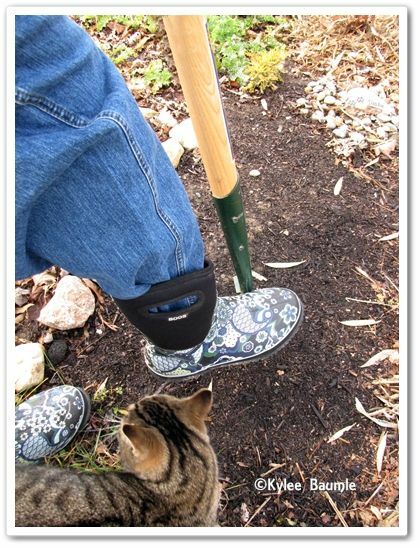 I've been given a garden item to trial and review, which is a good way for me to try new things and offer readers my "get down and dirty" gardener's opinion - good or bad. I've done business with a company and I've had a great experience, or one not so great. After several orders with Easy To Grow Bulbs, I just have to share my extreme satisfaction with this company. They have not contacted me in any way relating to my blogging about their company, nor have I told them that I was going to do it. 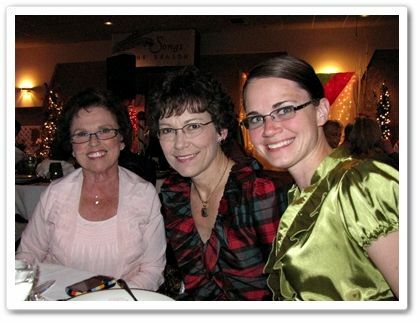 This is just me - a pleased customer - wanting to give a great company their due. 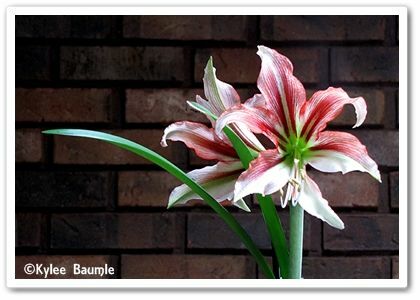 I first did business with Easy To Grow Bulbs in January 2007, when I ordered some amaryllis (Hippeastrum) bulbs. I was pleased with the quality of the bulbs and got some gorgeous blooms from them that year, and later years too, because I keep my bulbs from year to year, planting them outside in summer. Subsequent orders to the company were made, with once again, great results. A variety of bulb types have been in those orders and this year, I ended up placing two separate fall orders. The first arrived in good time and with the highest quality of bulbs. Their bulbs come in nice mesh bags that I keep and use for storing summer bulbs over the winter. Attached to the top of the bags are the name of the bulb, with planting instructions. Only one thing could be done that would make the packing complete, and that would be to include a plastic plant marker that could be planted with the bulbs for easy identification. 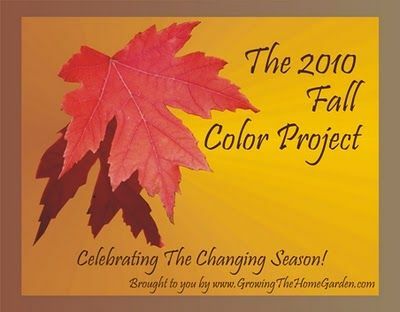 (Brent and Becky's Bulbs and High Country Gardens - also great companies that I do business with - do this.) But a grease pencil on popsicle sticks works well, too. After the bulbs flower in the spring, they get a more permanent marker. Besides the great quality bulbs, which are some of the largest I've ever seen, what has me raving about Easy To Grow Bulbs right now comes under the label of customer service. I've always had great customer service from Kathleen and her bunch, and perhaps this isn't out of the norm, but I'm pleased all the same and wanted to say so. Second, if your order is over a certain amount - a reasonable $50 - you get a bonus pack of bulbs. Since I placed two orders this fall, I got two different bonus packs. They call them "Adventure Packs" and many of them are from The Flower Fields at Carlsbad Ranch. 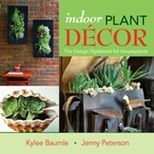 They're the only online distributor of bulbs from there, along with a handful of gardening catalogs and select garden centers there in California. And third, they say they have speedy shipping, and it's true. I placed my last order on Tuesday and the bulbs were here by Friday. All the way from California to Ohio. We had Indian Summer all week and knew that it was to end abruptly on Saturday, so that quick service was important. This time of year, we could just as easily be shoveling snow. I was really, really happy when the mailman delivered those bulbs on Friday. By the way, my Adventure Packs contained good stuff! In the first order, they included a 10-count package of Tulipa dasystemon 'Tarda', a species tulip. I LOVE species tulips, and have many, but not this one. I do now! 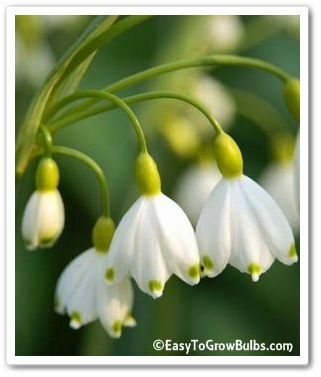 In the second order, I nearly jumped up and down, because my Adventure Pack contained five of something I very nearly ordered - Leucojum aestivum 'Gravetye Giant', often called "summer snowflake," since they are a late-blooming spring bulb. Easy To Grow Bulbs markets themselves as sellers of "Bigger, better bulbs for warm weather gardens." Don't let that "warm weather" part keep you away, if you're a northern gardener like I am. 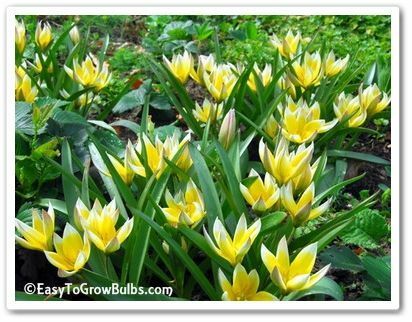 The bulbs I've received from them are first quality and grow just fine in my zone 5 garden. They are also in the Dave's Garden "Watchdog 30" list of the highest-rated companies in their entire database of 1,172 mail order garden companies. That's saying something. You know who rates them? Customers like me.